One of the first obtainable maps of Missouri. 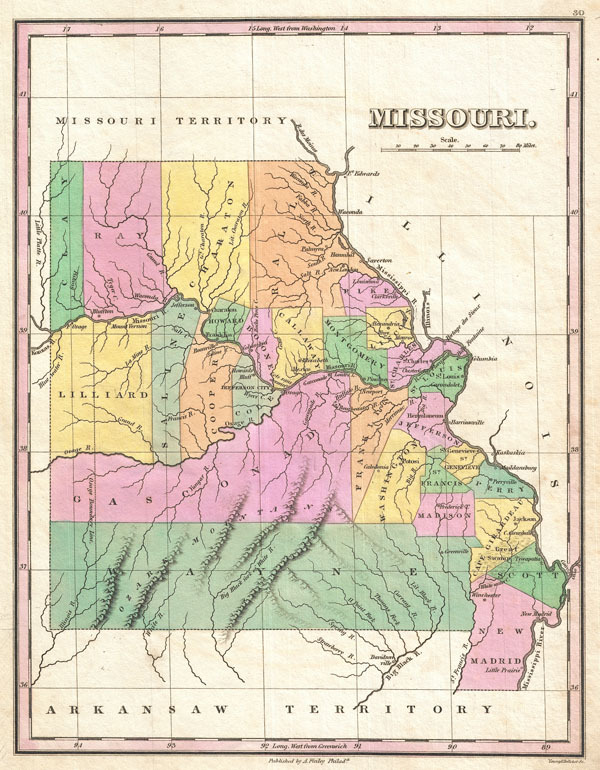 A beautiful example of Finley's important 1827 map of Missouri shortly following statehood. This is one of the earliest obtainable maps of the State of Missouri. Depicts a very early county configuration with most of the population attached to the Mississippi and Missouri rivers. The western portion of the state is defined by large counties and is largely uninhabited. Engraved by Young and Delleker for the 1827 edition of Anthony Finley's General Atlas. Karrow, R. W., Checklist of Printed Maps of the Middle West to 1900, 9-0755. Phillips (Atlases) 4314-30. Ristow, W., American Maps and Map Makers, p. 270.